Score a goal in this NHL Chicago Blackhawks Kid's Uniform Set. This set will have you looking and feeling like a real hockey player. If the Blackhawks are your favorite hockey team, this is the perfect costume! 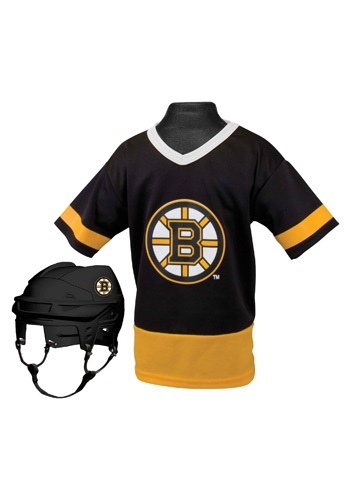 Gear up for the big game in this Kids NHL Boston Bruins Uniform Set. Your little one will have the confidence to drive the puck down the rink when he wears this cool set. It looks just like what the Bruins wear when they play their games! Be the Red Wings number 1 fan when you wear this NHL Detroit Red Wings Kid's Uniform Set. Skate down the ice at full speed when you have this costume set on. This uniform is great for young NHL Detroit Red Wings Kid's Uniform Set. Wear this to the next game and cheer on your favorite player! Cheer for your favorite team, The Minnesota Wild! Attend all Wild games in this NHL Minnesota Wild Kid's Uniform Set and let everyone know that you're a true fan. This set is great for boys who hope to grow up and become a NHL player! Manuever the puck toward the goal in this NHL Philadelphia Flyers Kid's Uniform Set! If you are a Flyers fan then this is the costume for you. Practice your slapshot in this matching set. Become a fast-skating and goal-scoring Penguins player! This NHL Pittsburgh Penguins Kid's Uniform Set will make your child look like a little Penguin out on the ice. This is a great set to pick up for kids who love to watch hockey. Show up to the next NHL game wearing this set! Practice your slapshot in this NHL San Jose Sharks Kid's Uniform Set. This set is perfect for young hockey fans. Wear this costume to the next game and cheer on your favorite players! Practice your hockey skills while you wear this. This white hockey mask will make you look like a horror movie character! But for those who haven't seen the movies with Jason, this mask probably won't seem very scary. They might just think you're pretending to be Clark Griswold from that funny Christmas Vacation movie*.